We describe a family illustrating the diagnostic difficulties occurring when pyridoxine-responsive cystathionine beta-synthase (CBS) deficiency presents with thrombotic disease without associated ocular, skeletal, or CNS abnormalities, a situation increasingly recognized. This family had several thromboembolic episodes in two generations with apparently inconstant elevations of plasma total homocysteine (tHcy). When taking (sometimes even low amounts) of pyridoxine, the affected family members had low-normal tHcy and normal values for cystathionine, methionine, and cysteine. Withdrawal of vitamin therapy was necessary before lower cystathionine, elevated methionine, and decreased cysteine became apparent, a pattern suggestive of CBS deficiency, leading to the finding that the affected members were each compound heterozygotes for CBS p.G307S and p.P49L. To assist more accurate diagnosis of adults presenting with thrombophilia found to have elevated tHcy, the patterns of methionine-related metabolites in CBS-deficient patients are compared in this article to those in patients with homocysteine remethylation defects, including inborn errors of folate or cobalamin metabolism, and untreated severe cobalamin or folate deficiency. Usually serum cystathionine is low in subjects with CBS deficiency and elevated in those with remethylation defects. S-Adenosylmethionine and S-adenosylhomocysteine are often markedly elevated in CBS deficiency when tHcy is above 100 umol/L. 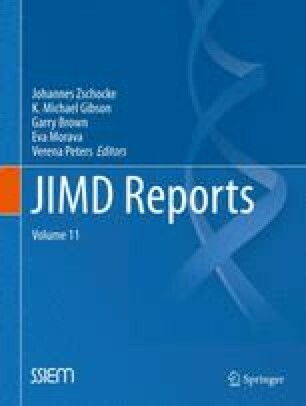 We conclude that there are likely other undiagnosed, highly B6-responsive adult patients with CBS deficiency, and that additional testing of cystathionine, total cysteine, methionine, and S-adenosylmethionine will be helpful in diagnosing them correctly and distinguishing CBS deficiency from remethylation defects. We would like to acknowledge the expert technical assistance of Carla Ray, Linda Farb, and Bev Raab. Preparation of the manuscript was assisted by Theresa M. Martinez. In connection with the puzzling history of a family with B6-responsive cystathionine B-synthase deficiency without decreased cystathionines, and usually with normal methionines, extensive data are presented on values of relevant metabolites that may facilitate the differential diagnosis of elevated total homocysteine. SPS, RHA, and SHM were responsible for planning the details in the manuscript. SPS, MK, RJ, RHA, JPK, EBS, CW, and SHM were all involved in the conduct of obtaining the clinical and laboratory measures described in the manuscript. SPS, JPK, CW, and SHM wrote the bulk of the manuscript with contributions from the other authors. Sally P. Stabler serves as the guarantor for this article, accepting full responsibility for the work. She had access to all the data and controlled the decision to publish. Two of the authors, Sally P. Stabler and Robert H. Allen and the University of Colorado have competing interests. A patent on the use of homocysteine, methylmalonic acid, and cystathionine had been obtained by the University of Colorado and the two authors, which is now expired. A company has been formed at the University of Colorado to assay homocysteine, methylmalonic acid, and cystathionine. The other authors do not have competing interests. JPK was supported by the American Heart Association Grant NA09GRNT2110159. The authors confirm independence from the sponsors; the content of this article has not been influenced by the sponsors. The compiled data came from studies previously reported which were under the purview of Institutional Review Boards as listed in the References. In addition, Protocol # 00–664 – “Methionine Metabolites in Inborn Errors” – was approved by the Colorado Multiple Institutional Review Board. Personal patient information for the case family is not included in the manuscript.